Posted on April 15, 2019 by gayle. 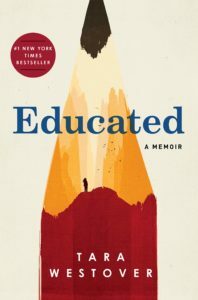 This entry was posted in 2019 EDIWTB Reading Challenge, Audiobooks, Memoir and tagged educated, tara westover. Bookmark the permalink. Your take on this book is so interesting and spot-on. I loved the book, but agreed that the cold/distanced retelling must have been Westover’s way to cope and process all that she dealt with. I just turned each page with increasing disbelief.